Kanchipurna, a devotee of Lord Varadaraja, in the truest sense of the word, was a native of Poonamallee, Chennai. Simple and childlike he attracted the affection of everyone and that included the Lord himself. It was believed that Kanchipurna had the rare privilege of conversing with the Lord everyday. It was this Kanchipurna who was repeatedly requested by Ramanuja to take him as his student. Kanchipurna demurred. He was of a low caste. But Ramanuja was adamant. There are no caste distinction amongst the devotees of God, he repeatedly stressed. Caught in a predicament, Kanchipurna found a way out. He ordered Ramanuja to bring water from the well everyday for the worship of the Lord - the first step in a life long journey of service to the Lord. In the meantime at Srirangam, many events were unfolding. Alavandar was on his deathbed. The question as to who was to lead the Srivaishnava community cropped up. At this juncture, two men from Kanchipuram brought in the news of the estrangement of Ramanuja from Yadavaprakasa. Alavandar’s face lit up. He had found a worthy successor. He could now shed his mortal coil in peace. He immediately summoned one of his disciples - Mahapurna and requested him to leave for Kanchipuram and bring Ramanuja. Mahapurna left on his journey. Little did he guess that his guru would also commence his journey, but to the other world. Mahapurna and Ramanuja set out towards Srirangam, where they arrived in four days but it was too late. As Ramanuja stood before the cadaver of Alavandar, he noticed that three fingers of Alavandar’s right hand were folded and clenched. “Were his fingers always like this?” queried Ramanuja. “No, no” came the reply. He pondered on what could the folded fingers imply and came up with these destinations: “I will always remain in the fold of Vaishnavism. 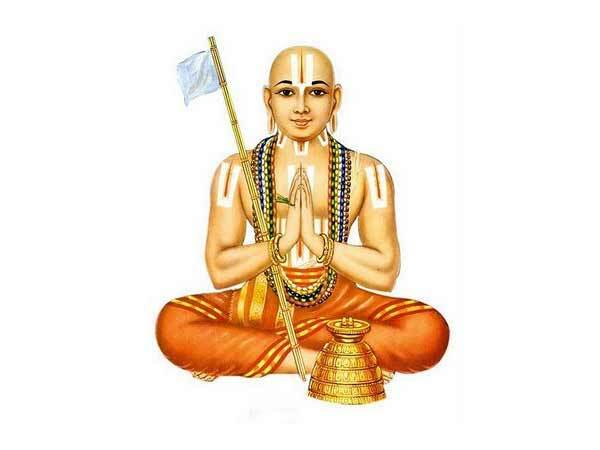 I shall dispel the ignorance of the common man, make him versed in the Dravida Veda and propagate the doctrine of surrender to God.” No sooner Ramanuja said this, one of the closed fingers of Alavandar straightened up. Ramanuja continued - “Taking into consideration all the available interpretations, I shall for the welfare of the people write the Sri Bhasya (commentary on the Brahma Sutras of sage Vyasa). The second finger of Alavandar now opened up. Ramanuja further continued: “In order to repay the grace of Vyasa who wrote the Vishnu Purana, I shall name one greatly learned Vaishnava after him.” The third finger straightened too. The crowd that included the elite scholars was amazed at what they saw. Words couldn’t have stated clearer that Ramanuja was the undisputed successor to the great Alavandar. However, sad at not having met Alavandar in person, Ramanuja returned to Kanchipuram with a heavy heart. With each passing day Ramanuja became emotionally closer to Kanchipurna, with whom he repeatedly pleaded to accept him as his student. One day, Ramanuja invited Kanchipurna to his house for a meal. Kanchipurna agreed but chose a time when Ramanuja was not there to have his food. Ramanuja’s wife, adhering strictly to caste stipulations, cleaned the whole place after Kanchipurna had had his meal and donated the remaining food to an indigent lower caste women. On returning home, Ramanuja was greatly pained at his wife’s actions and bemoaned her treatment of a sincere servant of God. Kanchipurna left on a pilgrimage to Tirupati and returned to Kanchipuram a few months later only to find a desolate Ramanuja. The next day Kanchipurna had a message for Ramanuja from Lord Varadaraja in which the Lord bade him accept Mahapurna of Srirangam as his guru. As luck would have it the guru and sishya encountered each other at a midway place called Madurantakam. At that very place and without any further delay, Mahapurna initiated his worthy disciple into the Pancha Samskara (five steps to become a Vaishnavite) The guru, his wife and Ramanuja then set out for Kanchipuram. Ramanuja accommodated them in his house and joyfully studied the Divya Prabandham at the feet of his guru. The time was nearing for Ramanuja to embark on the next stage of his life. He was ripe for sanyasa or acceptance of the ascetic order. At an appropriate occasion he donned the saffron robe and picked up the tridanda (staff). His wife was in her paternal home and Ramanuja set out for Srirangam. Life at Srirangam proceeded on a smooth path. Ramanuja was a student of excellence, imbibing all that was taught to him by Mahapurna. Mahapurna counselled Ramanuja that he was now fit to be a recipient of the highest level of spiritual education and directed him to go to Goshthipurna, a pious scholar, who lived at Tirukkottiyur not too far from Srirangam. This article was published in The Hindu (29.07.2016) which is an excerpt from the article published in Nrisimhapriya dated May 2003.